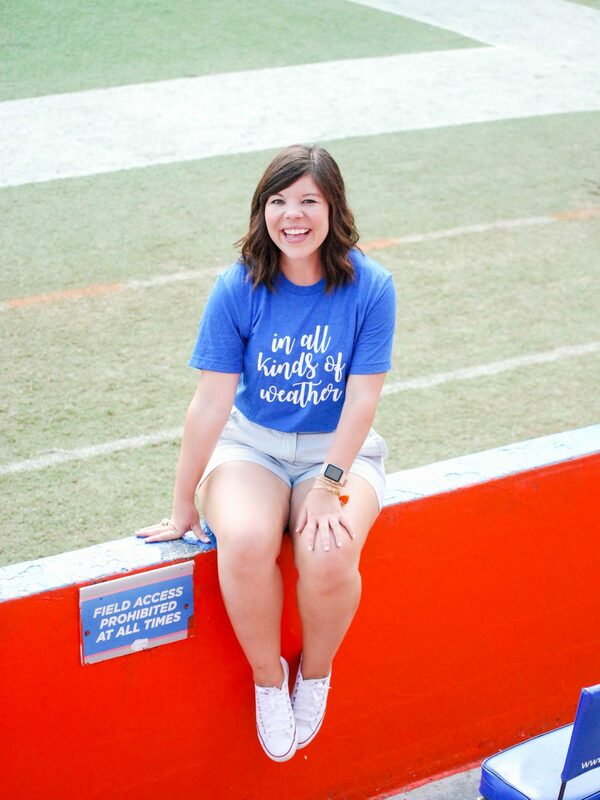 Sharing three of my favorite Gator gameday traditions today! Today is my last post in my “Tailgate Thursday” series and I’m so sad to see it end! 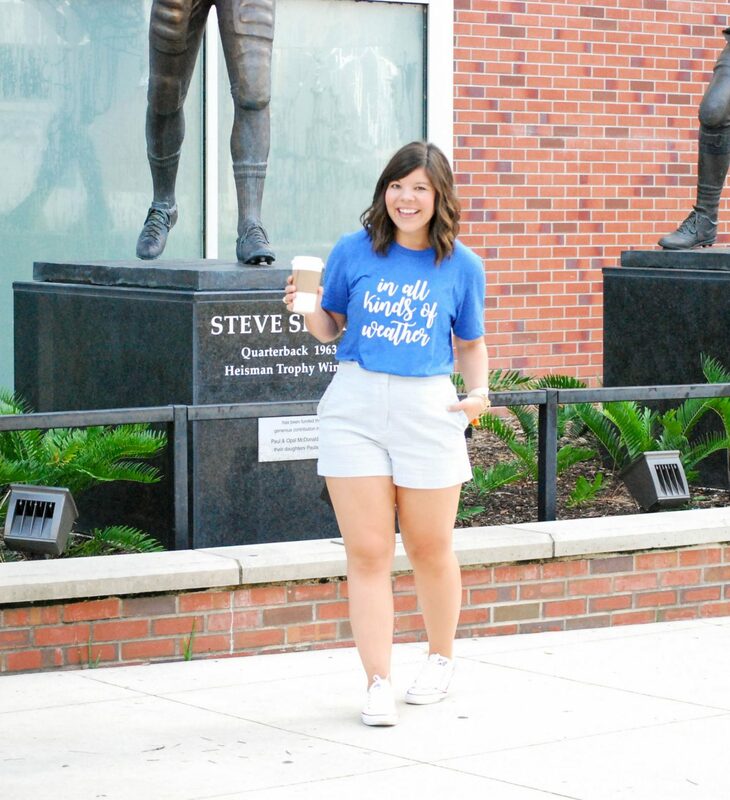 It has been the most fun getting to share my gameday style with y’all and I hope that you’ve gotten some inspiration out of it. 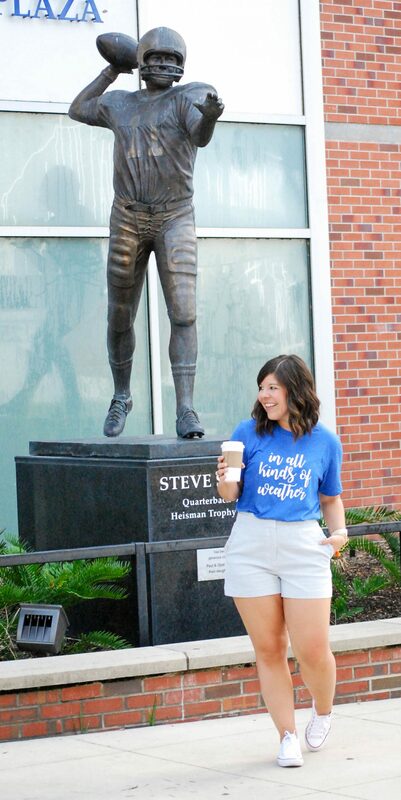 I think dressing up for gameday is such a thrill – and Lord knows you’re going to end up in tons of pictures – so it is definitely an occasion to dress for! 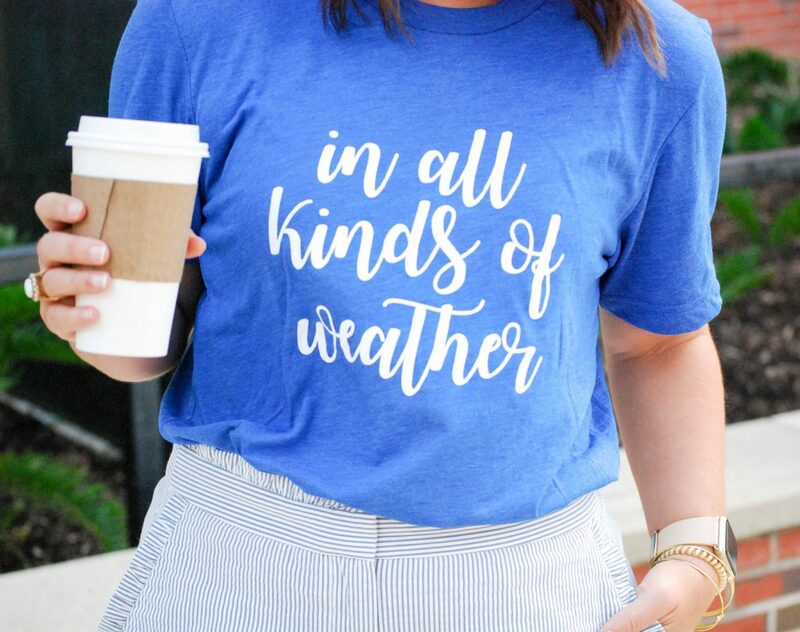 🙂 Today I’m once again teaming up with my friends over at Stewart Simmons to share the cutest tee ever! 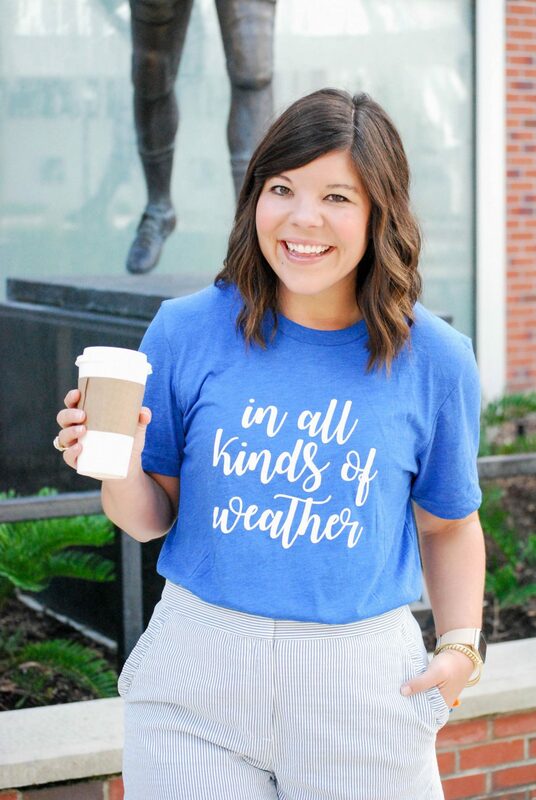 If you are a Florida fan (or know anything about us) than you have probably heard us say the phrase “in all kinds of weather” at one point or another. It’s our way of saying that no matter what happens, us Gators stick together and support each other! So, it was so fun to spot this perfect tee when browsing the site recently. It’s perfect for a casual stadium look or an afternoon game. To mix things up today (I like to keep it interesting!) 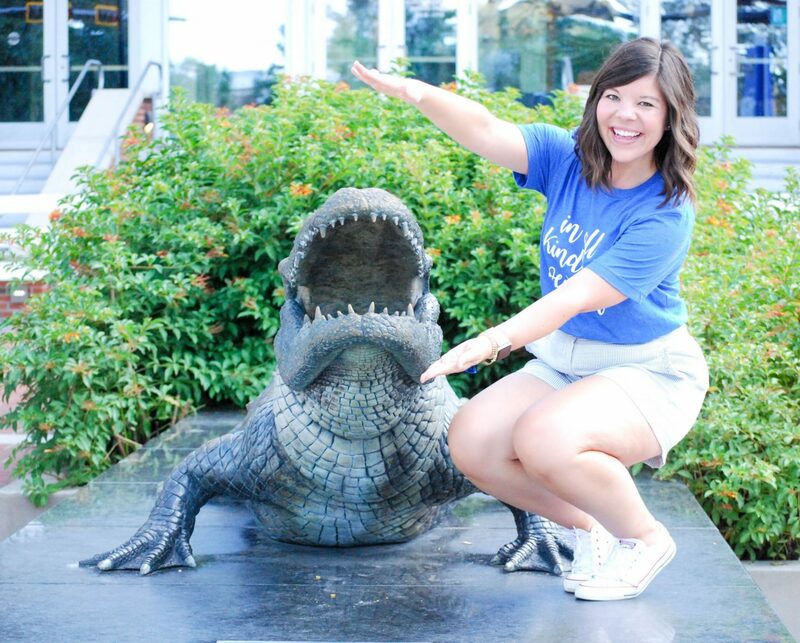 I wanted to share three of my favorite Gator traditions with y’all & I would love to learn about yours too! 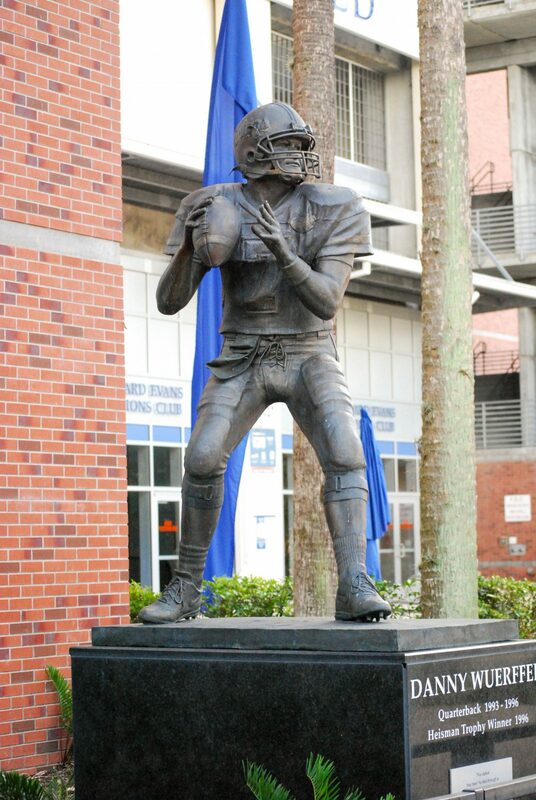 Before every Gator game there used to be a man nicknamed “Mr Two-Bits” who would come out and lead the crowd in the “Two-Bits” chant. It is a tradition that has been going on since my parents went to school there! A few years ago Mr Two-Bits passed away, so some games we have “celebrity” guests who lead the chant- but my favorite is when Albert (our mascot) comes out dressed like Mr Two-Bits and leads it! THIS IS MY FAVORITE THING AT EVERY GAME- ugh I just love it y’all! So we have a song called “We are the Boys” and at the end of every single third quarter (home & away games!) 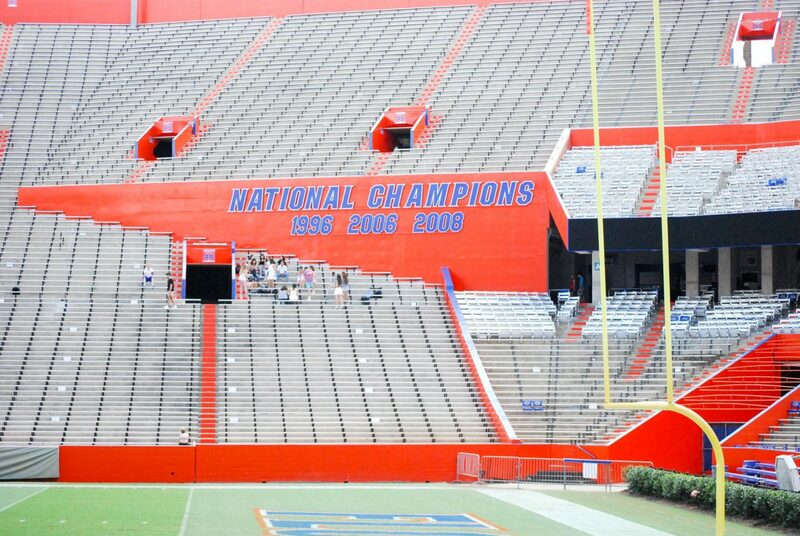 all the Gator fans put their arms around each other and sway and sing the song together. It is the coolest thing to see a crown of 90K singing the sweet tradition together! Fun Fact: This is the song in which the line “in all kinds of weather” comes from! I think I just love that no matter if were home or away, winning or losing, standing in sunshine or rain – everyone puts that aside to follow this meaningful tradition. I know I’m 100% biased but I think our mascots are just the cutest things in the world! 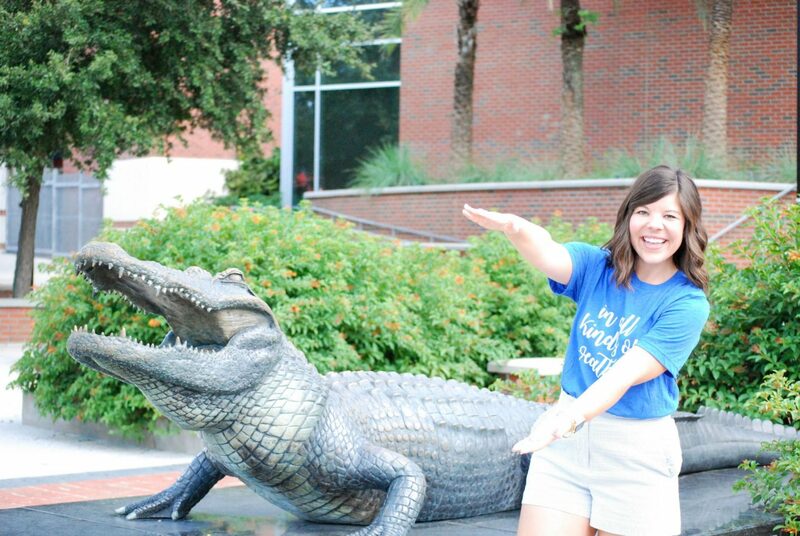 Our male gator is Albert & his girlfriend is Alberta… and you’ve never seen anything cuter! They are always all around the stadium on game days making their rounds and taking tons of pictures with fans. It’s always so much fun to commemorate a gameday by snapping a picture with them! 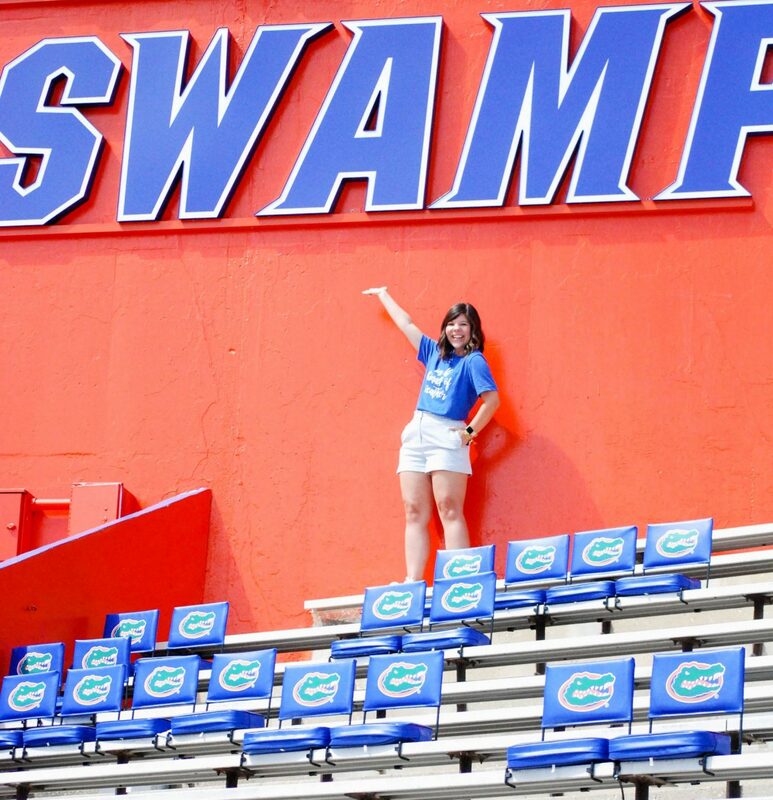 PS- These photos were shot at The Swamp (the name of our stadium) and it was so much fun to be in the stands and to get to share a piece of my alumni heart with y’all! This looks so much fun! Love your shorts dear, so adorable on you.